The products and services of Piantek Oy were awarded the Key Flag Symbol last week. 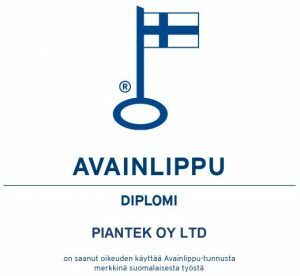 With the Key Flag Symbol we want to communicate the Finnish origin of our products and services. All our products are manufactured in Koskenkorva, Ostrobothnia. We have offices in both Ostrobothnia and Helsinki. Also in our acquisitions we prefer Finnish. The Key Flag Symbol is a registered collective mark owned by the Association for Finnish Work. We hope that our Key Flag Symbol will help our customers choose the Finnish option – we need one another in Finland. ABC Kuninkaantie station is being renovated. Cooperative Varuboden-Osla Handelslag has chosen Piantek Oy to be the overall building contractor for the ABC Kuninkaantie station. The Piantek contracting agreement includes the basic refurbishment work for the interior of the building and the construction work on the extension part of the building. Piantek will also be contracting the furniture for the supermarket and the restaurant. 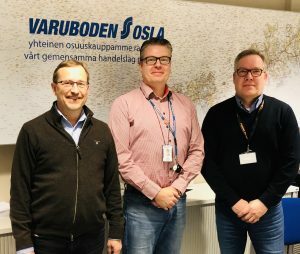 Development Director Jukka Pöyhönen (left), Head of Division Mikko Ala-Huikku of the Cooperative Store Varuboden-Osla Handelslag, and Business Director, COO Jyrki Vainio of the Piantek Oy signed the agreement for contracting on 25.1.2019. Piantek Oy is a reliable Finnish supplier of complete solutions for trade business. As a growing and internationally active supplier of special furniture, we offer design, special furniture and contracting solutions tailored for customers’ projects. Tainä Bäck began working at Piantek Oy as a key account manager on 14 January 2019. Taina will primarily be acting for development of selling and customerships. She will work at our Helsinki office. Taina has plenty of experience with corresponding key account manager tasks. We would like to welcome Taina to our team. We are delighted to have her solid experience and skills available for Piantek’s customers. Suitable materials for precision laser cutting or engraving are metals, plastics, wood, textiles, paper, glass and stone. The laser makes it possible to cut complex images without affecting the material’s properties. 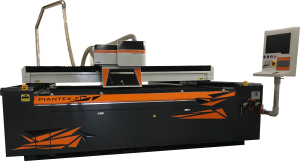 The laser cutting machine can also produce large, illuminated surfaces, known as Backlight panels. The machine has a working area of 2000 x 3000mm. Auli-Maija Ahonkari began work as Piantek Oy’s site designer on 6 August 2018. Auli-Maija is primarily responsible for the site design and management of customer projects. She will work at our Helsinki office. Auli-Maija has plenty of experience with demanding designer tasks. Nina Mönttinen began working at Piantek Oy as a project manager on 6 August 2018. Nina will primarily be acting as the responsible project manager in various customer projects. She will also work at our Helsinki office. Nina has plenty of experience with corresponding project manager tasks. We would like to welcome Auli-Maija and Nina to our team. We are delighted to have their solid experience and skills available for Piantek’s customers. The UV printer combines UV colors, energy saving LED light technique, CMYK + white extra color as well as a UV varnish function. The UV prints are immediately dry and the product will not need to be laminated. Possible printing materials include different kinds of wood materials, metal, glass, plastics and papers. The printer is also able to create surface structures. The finish can be either matte or glossy. The printings also endure being used outside. The printing area is 3600 x 2000 x 100mm. Piantek Oy is a fast-growing and reliable Finnish company specialising in complete retail solutions. The company is opening a new office in the Helsinki metropolitan region with the goal of continuing to ensure high quality services for its customers. With this expansion Piantek is bringing in new innovations and new services in order to boost its customers’ businesses. The company has brought in Jyrki Vainio, an experienced long timer in the industry, as their new COO and partner starting 1st of June, 2018. Jyrki Vainio’s mission is to open the new location and organization in the Helsinki metropolitan area to boost the company’s client accounts and their development. All the while he is in charge of the entire company’s marketing and sales as COO. Vainio has over 30 years of experience in the retail sector, having acted as both CEO and Sales Director. In his previous positions he has been in charge of numerous client accounts, including both Finnish and international brands. “We are happy to be getting Jyrki Vainio’s experienced take in leading Piantek’s clients. I believe that our clients’ businesses will benefit from us being able to provide even stronger overall services”, says Piantek’s CEO Tapani Renkola. 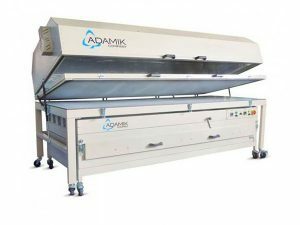 Piantek has invested in an Adamik vacuum press. With the new press it’s possible to bend Corian as well as UPM Grada plywoods into shape. The press also has a heating oven which can be used for bending and shaping different plastics. The new equipment enables processing even bigger materials up to the size of 1280 mm x 3450 mm. Piantek has taken part in the VÄRINÄ- research led by professor of architecture and urban research, Ari Hynynen. The VÄRINÄ- project examines the effect of constructed local environment and atmosphere on consumers eating habits. With the right showcase, colours and ambience we can make a positive impact on the choices consumers make. One of the goals of the project is to guide people towards healthier choices. The results of the research can be used by public and private food service producers, designers and constructors of interior spaces and urban environments as well as restaurants and experience stagers. Piantek is looking forward to use the results in its upcoming projects. Pohjanmaan Kaluste Ltd has become a stakeholder of Piantek Oy Ltd. The shared ownership means a lot as Piantek is moving into a new developmental phase. “Through the shared ownership we get to use the resources and knowledge of Pohjanmaan Kaluste Ltd. In the future we can provide our customers with a wider range of products. And therefore it creates us more resources to carry out bigger projects.” says Tapani Renkola, the CEO of Piantek Oy Ltd.
“The shared ownership with Piantek has an important strategic meaning for us in Pohjanmaan Kaluste, because through Piantek we can offer our products and knowledge to new kinds of projects that we haven’t taken part in before. Piantek has also very strong designing knowledge and innovations that in the future we can launch into home furniture. Naturally we also gain synergy profit in production, purchases and logistics.” says Timo Viitala, the CEO of Pohjanmaan Kaluste Ltd.
Piantek Oy Ltd designs, manufactures and installs tailor made furniture to malls, shops, ship and boat industry and other demanding spaces. Engineering technology, South Ostrobothnian carpenter skills and the modern production equipment combined together, ensure the quality of our work. The quality of our work, as well as the reliability of shipping and the collaborated approach to the work are important for clients. Piantek offers the most efficient service and has reached the highest inner and outer quality requirements. The company is environmentally friendly. Pohjanmaan Kaluste Ltd is one of the leading furniture manufacturers in the Nordic region. The headquarter is located in Kurikka, in the Southern Ostrobothnia region of Finland, where the company has operated for over 50 years. Pohjanmaan Kaluste Ltd’s products are sold buy the biggest furniture chains in Finland as well as smaller private owned furniture stores. There is over 400 skilled professionals working for the company and they ship to 16 different countries. The company’s own designing and product development department ensures a collection that is constantly recurrent. Their biggest strengths are producing custom made furniture for the need of every individual, the flexibility of the customer service package and highest technical quality. Functional couches, convertible sofas, lounge chairs, coffee tables, wooden sets and closets, drawers and cupboards are some of the things Pohjanmaan Kaluste produces. Along with the Pohjanmaa- collection Pohjanmaan Kaluste has a unique, environmental friendly Luonto- collection. The pure materials used, the traditional hand craft skills and the environmentally friendly production process are essential in the marketing of the Luonto- collection. The Luonto- collection, launched in 2011, is sold by many furniture chains and stores around the USA. Porkka Finland Ltd is an internationally recognised company that produces commercial customer based refrigerators and freezers. Their range incorporates equipment for food storage and handling, specialist scientific items, chilled display cabinets and beverage counters as well as refrigerators and freezers. Porkka Finland’s customers include kitchens, restaurants, hotels, industrial canteens, hospitals, laboratories and fast food outlets in the catering section all around Europe. Among other things Porkka Finland Ltd produces together with Piantek Oy Ltd different kinds of service counters. These service counters are custom made to meet the requirements of the customer. Different kinds of spaces can be used efficiently. The final results are high quality, stylish, efficient and compatible.